Moda Repeat touts the benefits of consignment shops with two lists explaining why the resale boutique is a good place to shop—and why readers should resell their used clothing. Contact information on the right makes it easy to learn more about both topics. The back of the card offers detailed shop information and dainty designs. 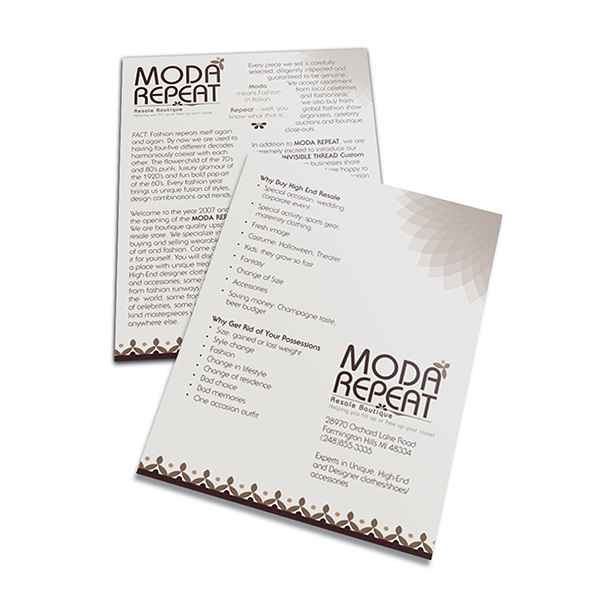 Tiny butterflies, a stylized border, and a large flower collaborate to give Moda Repeat a delicate, feminine appearance. Four-color process printed on both sides of 14pt C2S Semi-Gloss stock. Side 1 coated with High Gloss UV. 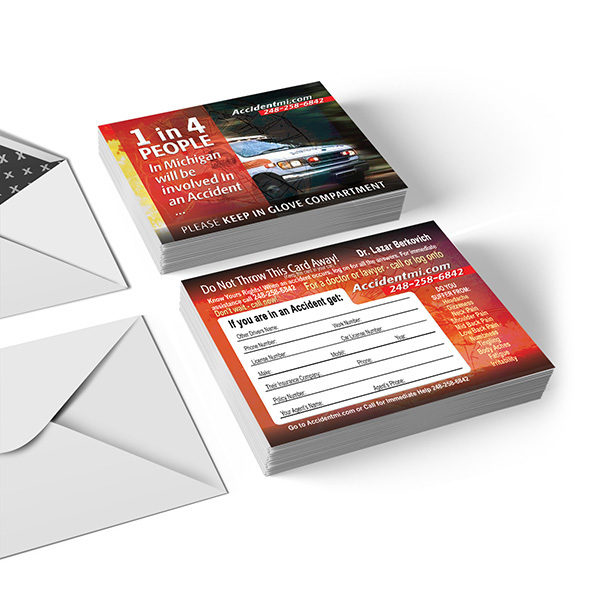 Flashy red accents create urgency on this post card for AccidentMI, a website designed to help Michigan residents deal with the aftermath of auto accidents. On the front, a photo of an ambulance with lights blazing mingles with a statistic about Michigan accident rates. A form on the back of the card tells victims the proper details to obtain from the other driver. Contact information helps them locate a doctor to treat any wreck-related injuries or a lawyer to deal with the legal ramifications of their accident. Four-color process printed on both sides of 14 pt C2S White Semi-Gloss stock. 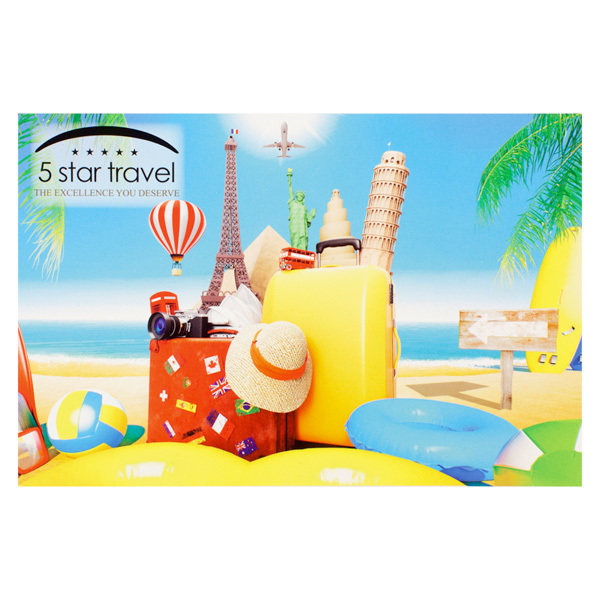 The front of Five Star Travel's postcard depicts a colorful beach scene with several iconic world landmarks blended in. It's a fun, jubilant image that celebrates the agency's passion for travel and entertainment. The back features the company's logo, contact information, and website URL, with extra space for a personal message. Four-color process printed on both sides of 14pt C2S White Semi-Gloss stock. 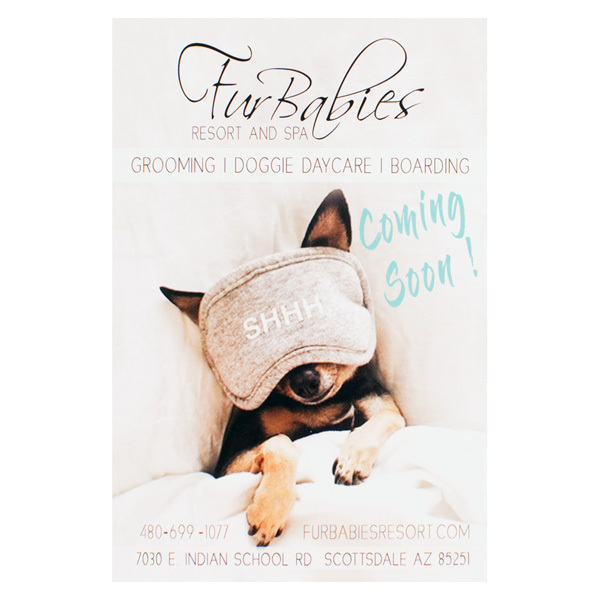 Both sides of this adorable postcard from Fur Babies Resort and Spa feature cute photographs of beloved canine companions. The front also includes the company's logo and a list of their services, along with contact information. This 4" x 6" product is compact, yet still large enough to catch clients' eyes. Available in portrait or landscape orientation, its layout can shift to fit your print materials—whether that means columns of written copy or wide, colorful photos. Imprint just one side, or maximize your design space with custom imagery, forms, or promotional information on both sides. Dimension Closed: 6" x 4"